Corrugated tin roofing or corrugated iron. corrugated tin roofing AKA corrugated iron would have to be the single material that defines the the pioneering days of many countries. Certainly in Australia it has reached an iconic status in thousands of photos and paintings of rusty homesteads, water tanks and windmills. 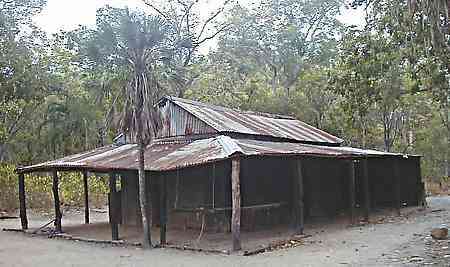 Corrugated tin roofing - Definitely not a thing of beauty, this original corrugated iron outstation homestead is still capable of doing the job after over seventy years. The roofing that I am talking about here is the galvanised iron that helped people to settle many of the worlds remote areas in the 19th century. From the pampas of South America to the goldfields of South Africa. It is seen on saloon roofs in the US "wild west" and on cattle stations in the Australian outback. The process of hot dip galvanisation was discovered around the 1820's. That is the metal was dipped into a bath of molten zinc or a zinc alloy. Henry Palmer a London engineer discovered the corrugating process also in the 1820's. So by the 1830's corrugated galvanised iron (CGI) was being produced in great quantities in Britain and the products and the process was exported all over the world. The original metal used in the process was wrought iron, which was very soon replaced by steel, but the name iron still lives on. The term tin roofing comes from the process of tin plating iron sheets which has been around since the 16th century. I guess the name came from the fact that maybe the very first corrugated sheets that were produced used tin plated iron. Very soon the coating changed to zinc and the iron changed to steel. Funny enough the preferred method of sealing galvanised "iron" was by soldering, which was a skill of the tinsmiths of the time. We still use many terms tin snips which of course are not used to cut "tin" sheets any more. 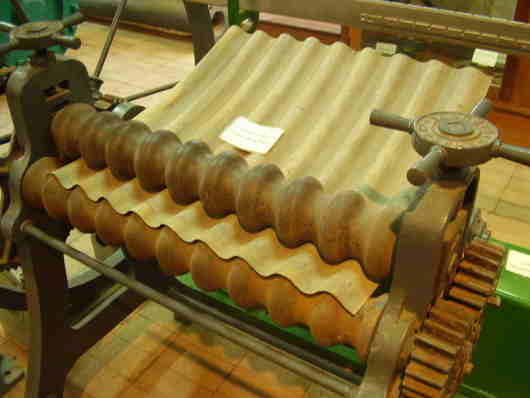 Corrugated tin roofing - An early roll forming machine. The material had to make several passes through a machine similar to this one. There was a bottom roller directly under the top roller which would be lowered after each pass. Modern machines of course do it in one pass, but they use the same principal. A series of rollers that each in turn gives a greater bend to the steel. This particular machine has two bottom rollers set not directly under the top roller, and so (again in a series of stages) a curve can be induced in the sheets. Photo thanks to User:Peripitus, Wikipedia. 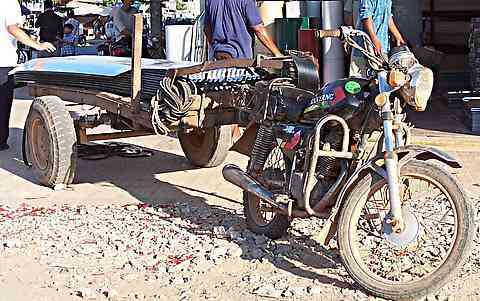 What other material can you transport with a motorbike, enough roof sheeting for a whole house? Corrugated tin roofing - ready for delivery. Corrugated sheeting produced from a small shed in Northern Cambodia - 2005. The lengths of the sheets here suits the available transport. This wonder material of it's day found immediate use for many reasons in a world that was bursting with expansion. The simple fact of corrugating a flat sheet of steel provided enough structural stiffness along the lengths of the sheets that a lot of external stiffening members where immediately made redundant. Immediately making the roofing process cheaper. The material has a high strength to weight ratio. Compare it to slate, clay tiles or other similar roofing. It is compact and easy to transport. Corrugated sheets lend themselves well to prefabrication. At the time and also to a certain extent today, these roll formed roofing materials needed a lost less skill and training to install than other competing materials. Steel mills are huge production factories that are few an far between, but since the invention of the roll forming process it is now possible to transport coils or the sheet material economically to small local roll forming businesses. Corrugated tin roofing - The typical spangled appearance of galvanised iron. This is the underside of the old restored church restored building shown on the tropical building page here. Corrugated tin roofing has had a long history. It has been phased out since 1972 in most countries in favour of the modern equivalent which goes under various trade names but is made under licence from the Galvalume ® company. It is a 55% Al-Zn coated sheet steel product. 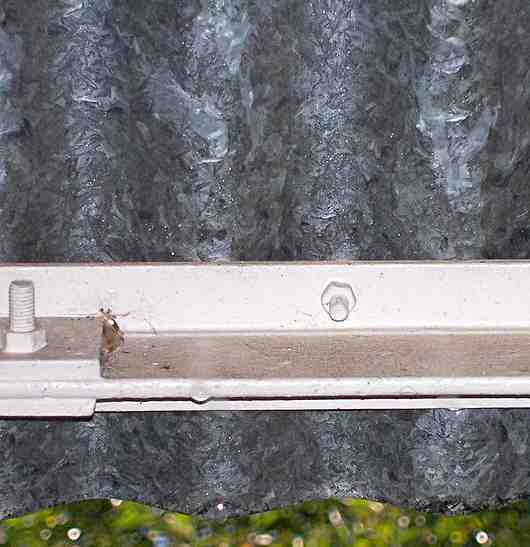 While the base sheeting is coated with the aluminium and zinc alloy, it looks similar to the old galvanised iron, but it does not have the spangled effect. In many instances it is also covered with various paint finishes and colours. While looking somewhat similar and having all the advantages of the old material, you must remember that it is a different product and it can not be treated quite the same as the original galvanised sheeting. The old sheeting could be soldered for watertight seals, and then when silicone sealers came out it was sealed with standard acidic cure silicone. The new Galvalume, Zincalume products have to use NON ACIDIC CURE sealants. Flat galvanised sheets and rolls are still widespread and they are used for various jobs. In general they are thicker than the standard steel roofing sheets and they should wherever possible be kept separate from the Zincalume type sheets. See the galvanic corrosion page for more on this.